5% of the home owners answered their roof was in good condition but an extenuating circumstance had arisen that caused the emergency. For example, a heavy tree branch fell on the roof during a storm, a severe hailstorm caused damage to the roof shingles, or unusually high winds caused blown off shingles. They did not want to spend the money on roof repairs. They did not know any roofing companies in the area for roof repair. They did not have time to arrange for roofing contractors to inspect the problem. They did not know they had a roof leak problem. To the 5%, we say this – roofing emergencies happen on occasion, and we promise we will be there to correct the situation as quickly as possible, even if you call us in the middle of the night. To the 95%, we have some recommendations. 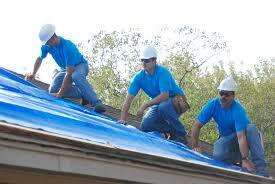 An experienced, professional roofer will charge you a fair price for roof repairs. Our goal is to put an abrupt stop to the problem before it gets any worse. The longer you wait, the more water damage you will have. You save money by fixing roof leaks while they are small. If you don't know who to call when you have things like chimney leaks, skylight leaks and other roof leaks, ask your neighbors who they trust. A satisfied customer is happy to recommend an efficient roof repair contractor. If you don't have time to make arrangements, call us anyway. Small issues turn into emergencies, and this will take up your time whether you like it or not. Regardless of the quality of your roofing materials and the age of your roof, the moment a new roof is installed it begins to deteriorate. There is nothing 100% impervious to the weather and the sun. Sooner or later you are going to need a little work done on your roof. The solution to the last four problems is to have your roof checked out at regular intervals. We will give you a free roof inspection at least once a year. This is the safest way for you to protect your home from serious damage and the cost of major roof repairs. As a homeowner, what you can do is to take a look on the inside of your home. Is there condensation on your windows when it is cold outside? Do you have any water staining on your ceiling and walls? Peeling paint, wallpaper and mold growth are also indicators that there is something wrong. These are the indicators to let us know about so we can find the source of the problem. Don’t forget, while performing any roof repairs on your home, we include your gutter system. We visually inspect for leaves and debris in and around the roof. These organic materials can eventually build up and clog your downspouts. Clogged gutters can cause water damage to your roof and fascia. Water pouring over the gutters can end up next to your home’s foundation, in the basement or crawlspace. Leaves and other materials accumulating on the gutter system can also build-up and cause your shingles to deteriorate rapidly. Branches brushing against gutters can dent and damage the integrity of your gutter system as well. As a homeowner, you will want to be proactive and complete the repairs needed to your roof as soon as possible. This will lesson the chances of any additional expenses accruing because of delays in maintenance.